Kit, Fuel & Vacuum pump repair. These are high quality master repair kits for the M38, M38A1 & M170. This kit is set up for the linkage which takes hook type diaphrams on both sides. The later type linkage uses hook type on the fuel side and turn lock on the vaccum. 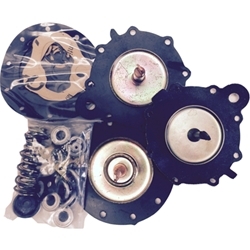 We offer a kit which includes this diaphram set up too. See related items below.